On Tuesday 23rd June, the Constitution Unit held a day-long conference to mark its 20th Anniversary. The event featured a number of high profile speakers and respondents, all of whom had engaged with the Unit in some capacity since its establishment in 1995. The day began with a presentation from Vernon Bogdanor on 'The Constitution Unit and the British constitution'. This was followed by five sessions, each focussing on one aspect of the Unit's contributions to the policy agenda to date: in the morning Charlie Jeffery talked about territorial politics and devolution and Dawn Oliver discussed human rights and the judges. In the afternoon, Tony Wright focussed on the Unit's research on various aspects of parliament, while Alan Renwick discussed the work on elections, referendums and political parties and Peter Riddell talked about contributions to the study of coalition government, ministers and special advisers. Each session also featured two respondents, one from the policy world and another from amongst the Unit's former staff. 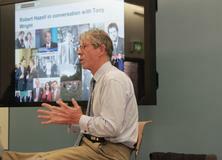 The event concluded with Robert Hazell 'in conversation' with Tony Wright. The session, which gave audience members an insight into Robert's personal journey establishing and developing the Unit, was both a fitting end to the day and an appropriate way to mark the end of Robert's directorship. Robert Hazell was interviewed on BBC Radio 4's Westminster Hour, talking about 20 years of the Constitution Unit. See below for a series of posts adapted from presentations at the Unit's 20th anniversary conference, held on 23 June 2015 that will be posted throughout August.